In the afternoon of 07 July 2016, H.E. Mr. Leng Peng Long, Secretary-General of the National Assembly, chaired a meeting to examine the working outcome of the preparation and directions to be implemented for organizing the 9th Asian Parliamentary Assembly (APA) and its executive meetings, which will be held in September and November 2016. The National Assembly of the Kingdom of Cambodia is scheduled to host the 9th Plenary Session of the ASIAN Parliamentary Assembly (APA) in the late November to the early December 2016. A preparatory meeting towards the 9th Plenary Session of the APA was held at the National Assembly palace in the morning of 17 June 2016 under the presidency of H.E. Dr. Nguon Nhel, Second Vice-President of the National Assembly, and Chairman of the Organizing Committee of the 9th Plenary Session of the APA, with the aim of promulgating some decisions for actual implementation in order to ensure the successful organization of this international event. 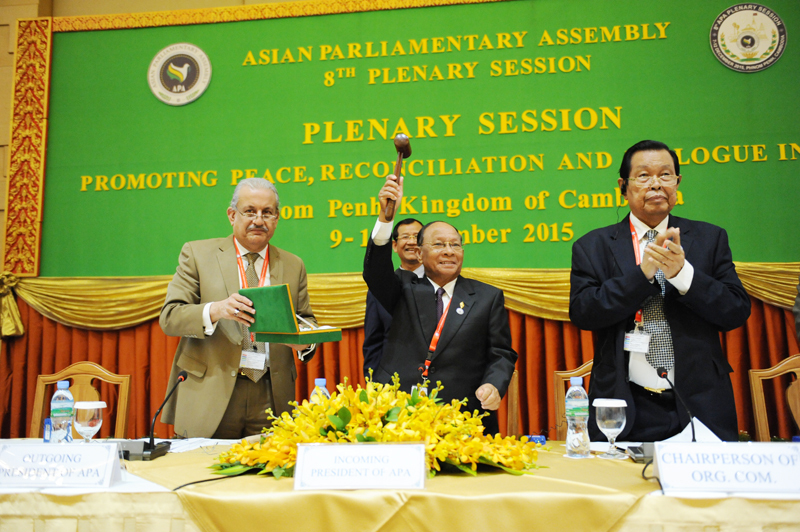 The Parliament of the Kingdom of Cambodia is to host the 9th Asian Parliamentary Assembly (APA) Plenary Session in the end of 2016 after successfully hosting the 8th APA in the early December of 2015. H.E. Dr. Pen Pannha, Chairman of the Commission on Legislation and Justice of the National Assembly of the Kingdom of Cambodia, chaired a preparatory meeting with National Assembly Secretary-General H.E. Mr. Leng Peng Long, along with concerned officials to discuss preparation for the forthcoming 9th APA Plenary Session, which will be held in the Kingdom of Cambodia in the end of 2016. Samdech Akka Moha Ponea Chakrei HENG SAMRIN, President of the National Assembly of the Kingdom of Cambodia, and President of APA, offered a courtesy call to H.E. Mr. Faisal Alshaya, Kuwaiti Member of Parliament, at Sokha Phnom Penh Hotel and Residence on the occasion of the 8th APA Plenary Session hosted by the Kingdom of Cambodia. After fruitfully concluding the 8th APA Plenary Session in the evening of 11 December 2015 at Sokha Phnom Penh Hotel and Residence, Samdech Akka Moha Ponhea Chakrei HENG SAMRIN, President of the National Assembly of the Kingdom of Cambodia and President of APA, hosted a solidarity dinner reception in honor of honorable APA delegates, national and international distinguished guests attending the plenary. Members of Parliament from twenty-two Asian countries gave a loud applause to the closing session of the 8th Asian Parliamentary Assembly in the evening of 11 December 2015 at Sokha Phnom Penh Hotel and Residence. Members of Parliament from Asia are shoulder to shoulder and show firm solidarity with Asian family. The closing session was held under the presidency of Samdech Akka Moha Ponhea Chakrei HENG SAMRIN, President of the National Assembly of the Kingdom of Cambodia, and President of APA. In the afternoon of 10 December 2015, the Standing Committee on Social and Cultural Affairs of the APA Plenary Session discussed and reviewed 9 draft resolutions for adoption at the Plenary Session, which was held on 11 December 2015. Samdech Akka Moha Ponhea Chakrei HENG SAMRIN, President of Cambodian National Assembly of the Kingdom of Cambodia, become the president of the APA On 9 December morning. The handover ceremony of the chairmanship of the APA was held during the 8th APA Plenary Session at Sokha Phnom Penh Hotel and Residence. The Plenary Session of APA on 10 December this morning has continued its meeting of the Standing Committee on Political Affairs. The Cambodian delegation led by H.E. Dr. Pen Panha, Chairman of the Commission on Legislation and Justice of the National Assembly, and the Chairman of APA Political Committee, attended the meeting.